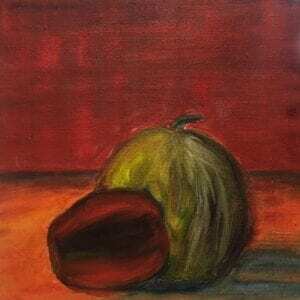 This winter I decided to take an oil painting class with Nina Weiss at the Evanston Art Center. Oil paints are a medium I have avoided for my entire adult creative life! The reason I want to learn now is to be able to incorporate them with the encaustic medium. 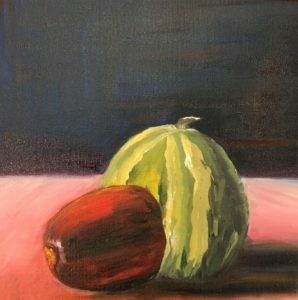 I also hope to combine oil paint with cold wax medium… either way, I want to learn and improve my overall painting knowledge and skills by taking this class. It’s always interesting to see how other teachers lead, and it’s unavoidable that I compare their teaching style to mine. I think being a student with a new medium is a clear reminder of how new students might feel in my class the first time they experience working with the encaustic medium. So far, I’ve only been to two classes. A still life was setup (I dislike still life immensely!) and the goal was to learn about ground color, underpainting, and mixing color. The class is also color theory; if I had chosen to work with gouache or acrylic things would be going much quicker but neither of those mediums combines with encaustic or cold wax. I have probably spent more time working at home than I have in the two classes but I know for me the best way to learn is by doing it… over and over and over! I decided to start a small landscape study at home in order to better prepare for a larger version during class. It is the opposite way of thinking… applying layers of oil paint, as opposed to applying layers of watercolor. My background as a watercolorist goes back 30+ years. 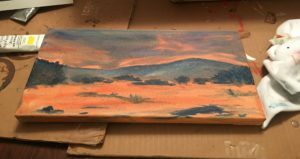 Painting with encaustic is also a different mind set from how I am learning with oils. I lean toward being self-taught but the color theory does not always sit well with my brain and I need guidance. I know all of this is a good lesson not just with the creative process but also with discipline, humility, and patience. It’s hard not being the expert! I am still adjusting to not being a “know-it-all” but color theory is starting to make sense. Thanks for posting here.